Those who shared a ring with Muhammad Ali became inextricably bound up with the man, their part in the legend of "The Greatest" casting a long shadow over their lives. Joe Frazier, who fought three epic battles with Ali, struggled for years to extricate himself from Ali lore before finally admitting defeat and finding peace. George Foreman, defeated by Ali 30 years ago, was never the same, plumbing the depths of despair before discovering God - and the advantages of grilling - and emerging a better man. "We're so tied in together you can't say rope-a-dope, you can't say "The Greatest", you can't say Muhammad Ali without saying George Foreman," he told BBC Sport. "Thirty years ago and I still hear about it. If I had known it was going to be such a big event I would have enjoyed myself a lot more, even in defeat. "Now, Ali is the best friend I've got." Following that fateful night in Kinshasa, Zaire, a shattered Foreman plodded on for barely two more years before a loss to Jimmy Young convinced him enough was enough. Ali, Foreman says, stripped him of his manhood. 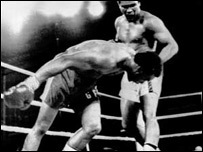 "It was the most devastating event as an athlete - I was certain I was going to knock him out in one or two rounds. "I went out there to get it over with as quick as I could so I wouldn't hurt him that bad but after three rounds I realised, 'we're going to have a fight here'. "I hit him a few times and he grunted and one time I shook his whole body and when the bell rang for the end of the fourth round he looked at me and looked up to heaven and said 'I did it, I made it'. "And I knew he had recovered from some of the most vicious beating I'd put on anyone. No matter what I hit him with he hit me back and covered up. "Then I hit the canvas and heard the referee counting and I realised, 'this is my life, this is not a boxing match'. "For years I agonised: 'How did this happen?' I'd lost everything I was - I wasn't even a man any more. "It took me a couple of years to get over it - I'd wake up in the night still shaking. It was mysterious to me why I didn't win that fight - no-one could stand up to my power. "I hit the canvas and realised 'this is my life...not a boxing match'"
"Sonny Liston, Joe Frazier and many others had beaten him up before but he'd always recover and give you his best. "For some reason I overlooked that - I never realised he'd have the most determination I'd ever seen in any human being." Foreman says he experienced an epiphany following that loss to Young in 1977 and, given a choice between "loneliness and hopelessness" and God, chose the latter. He became a preacher and did not fight again for 10 years before launching an unlikely comeback and regaining the world heavyweight crown at the age of 45 in 1994. 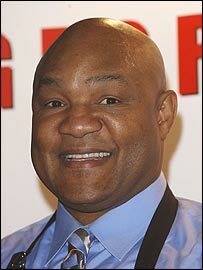 Foreman also turned from a brooding, intimidating force into an affable giant - and guru to the healthy eating courtesy of his ubiquitous Lean Mean Grilling Machines. And he owes it all to Ali, whose legend Foreman is only too happy to be a part of. "Heroes have a rough time because they stand up when they ought not to, they speak when they ought not to, they always have to go that extra mile," says Foreman. "Muhammad Ali is a true hero and the fact there's something wrong with him is his badge of valour. He's a great man."